National Sport Academy Hockey is a unique and specialized training and learning environment at Central Memorial High School for student athletes in grade 10, 11 and 12 with the goal of experiencing and developing the lifestyle of a student athlete as well as developing high level hockey skills and tactics to play at the Midget AAA, junior, college / university level and higher. Periodized sport training is designed to work in harmony with the demands of student athletes’ competitive sport training schedules and academic course load. Achieving a student athlete’s dream of being a high performance student athlete, playing junior or receiving an athletic scholarship and playing college / university athletics, working in the industry or making a career playing hockey or playing for your country are lofty goals. Training for this lifestyle is important. National Sport Academy Hockey lives up to our mission statement, “To inspire passion for the game of hockey while developing character for the game of life.” In addition to developing the physical attributes of the athlete, National Sport Academy Hockey works to provide the experiences and environment where each student athlete has the opportunity to develop good character. Who would benefit from National Sport Academy Hockey? Student athletes who are striving to play hockey at the Midget AA / AAA level, have aspirations to play at the junior and college / university level and above and are passionate about learning to lead the lifestyle of a student athlete will benefit from this program. I attend National Sport Academy Hockey? Professional, dedicated coaches coaching and training student athletes for approximately 160 sessions over 10 months of the year. Train during the school day. Balance in a student athlete’s busy life is critical. Use the flexibility in the program to succeed academically and athletically. Use your National Sport Academy Hockey training along with your club training to achieve the learning outcomes in Physical Education 10 (5 credits), 20 (5 credits) and 30 (5 credits) as well as the opportunity to use National Sport Academy training to achieve additional credits in Career & Technology Studies (CTS) modules. When does the National Sport Academy training take place during the day? 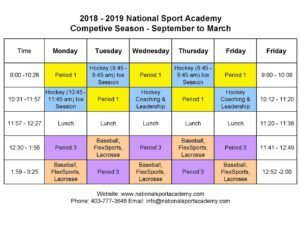 National Sport Academy Hockey training occurs in period 2 during the school day. In order to accommodate the student athletes’ pre or post training needs such as changing, showering and having lunch, the National Sport Academy training may start slightly earlier than the start of the school day. How do the student athletes get from Central Memorial High School to Stu Peppard Arena? Stu Peppard Arena is located three short blocks east of Central Memorial High School so student athletes can easily walk to the arena. How do the student athletes get their hockey equipment from Central Memorial High School to the training facility at Stu Peppard Arena? Student athletes must each have a second set of equipment which is then stored at Stu Peppard Arena in a heated secure storage room. Equipment such as skates, helmet and gloves, student athletes will usually transport back and forth in a sport bag and store in their locker at Central Memorial High School. We don’t recommend two pair of skates due to the cost and unique rocker on each pair of skate blades. Student athletes will bring their skates (helmet and gloves) from Central Memorial High School to Stu Peppard Arena, access their equipment from the Stu Peppard Arena storage room, get dressed and train. After the ice session, they will replace their equipment in the Stu Peppard Arena storage room and take their skates (helmet and gloves) back to school. Goaltender’s equipment is handled differently. If you are a goaltender, please let us know and we will explain how the equipment is handled. Many grade 11 or 12 student athletes that are driving will have one set of equipment they transport and store in their vehicle. What type of training experiences are the student athletes exposed to in National Sport Academy Hockey? National Sport Academy Hockey targets 55 ice sessions per year, from late September to mid-March, but recognizing there may be school field trips or other academic conflicts that may result in some students missing ice sessions and training, the National Sport Academy will typically schedule 55 – 65 ice sessions. Student athletes work with the National Sport Academy coaches to effectively manage their training – knowing when to train hard and when to take an ice session off due to a conflict with academics or workload. Quality purposeful practices develops high level skills. 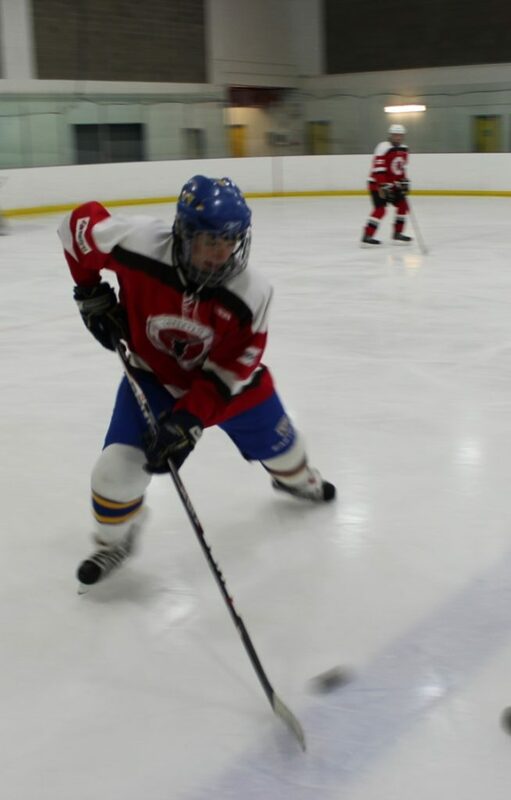 The student athlete experiences a combination of drills, activities, small area and competitive games in order to develop their offensive and defensive individual skills / tactics and Hockey IQ. It is important to work on advanced skills and tactics in a controlled setting but they must also be taken to a competitive game situation where they can learn how to use them. Competitive small area games and competitive situations within the National Sport Academy ice sessions provides the opportunity to learn advanced skills and tactics, make mistakes, go do it again and get the coaching and repetitions to achieve improved skills, tactics and Hockey IQ that can be used with their club teams. Student athletes who are striving to become the best they can be, need a safe trusting environment where they can make the necessary mistakes to develop, improve and implement high levels skills and tactics with less time and space and increased traffic and pressure. Innovative games and competitions that require high level skills and tactics to have success are implemented by National Sport Academy coaches that help that players manage their mistakes. The concept of “failing forward” is an important concept of the National Sport Academy and critical to an athlete’s development and success. 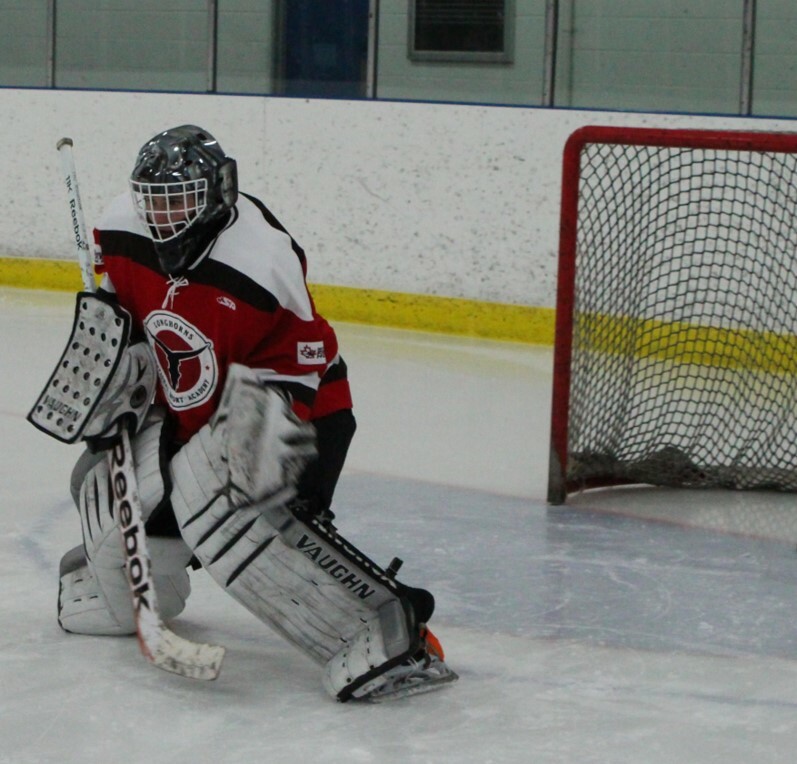 Continued development of technical skills with the goaltender’s style in mind. Emphasize movement and mobility – efficient movement and play. Improve and develop through drills and competitive small area games to simulate game experience – practice in a similar environment to your games. Work on the psychological and emotional part of the game to manage performance. Develop multi-directional / multi speed skating – the agility and quick feet to escape traffic & pressure, find open ice and play at higher levels. 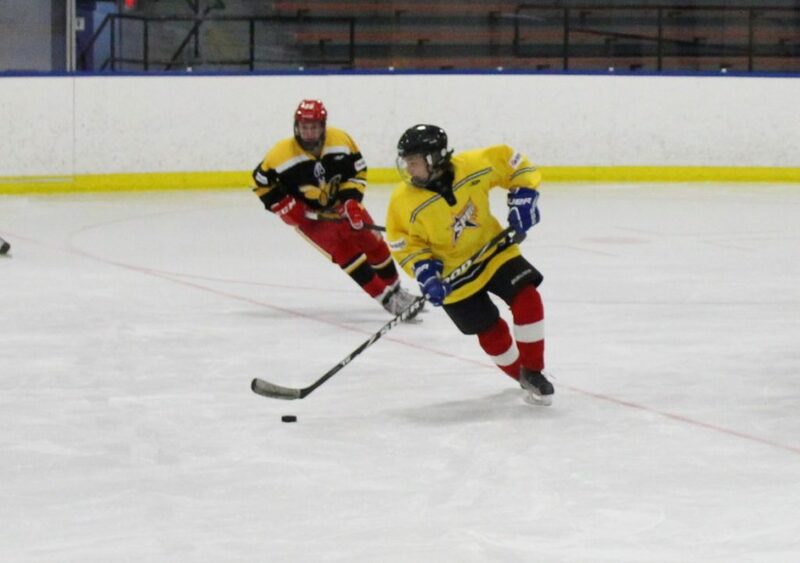 Skate from the waist down (handle the puck from the waist up). Develop sound skating mechanics to complement puck handling, passing and shooting skills required to compete at a higher level. Drills, small area games and competitive games to implement and improve high level skating skills. Develop and improve vision and awareness – the key to being a play maker and producing results. Developing width and depth in puck handling to increase the ability to release and receive the puck from various points all around the body for puck handling, passing & shooting. This is no easy task and takes repetitions over many years to become competent. Developing & reinforcing the puck handling mechanics on the journey to develop high level puck handling skills. Become the player you don’t want to check! Improve release – quick and deceptive. Combine shooting with movement, skating agility and puck handling to be deceptive. Checking is everything we do individually and as a team when we don’t have the puck. Continue to develop (or introduce) the 4 steps of checking. Similar to the higher levels of hockey, knowing how to check – to maintain defensive side positioning, knowing when to pressure and when to contain and having a good stick are just a few of the skills necessary to play the game when you and your teammates don’t have the puck. It is important to work on advanced skills and tactics in a controlled setting but these skills must also be taken to a competitive game situation where the players can learn how to use them. 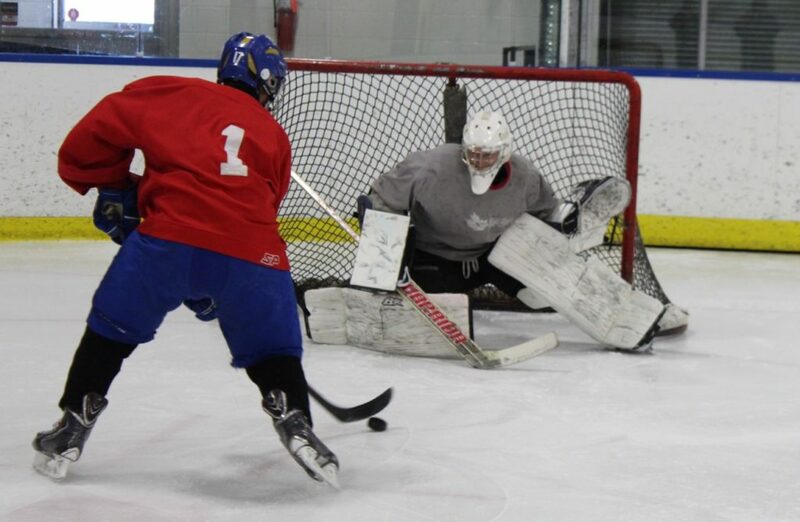 Learn, practice and receive the necessary repetition to maximize your individual and team play with the puck as well as the 90% of the game the player plays without the puck in competitive and small area games. Competitive small area games – the practical application of developing skills and tactics. Develop the Hockey IQ to thrive in the chaos of a game and maximize the use of the advanced skills and tactics. 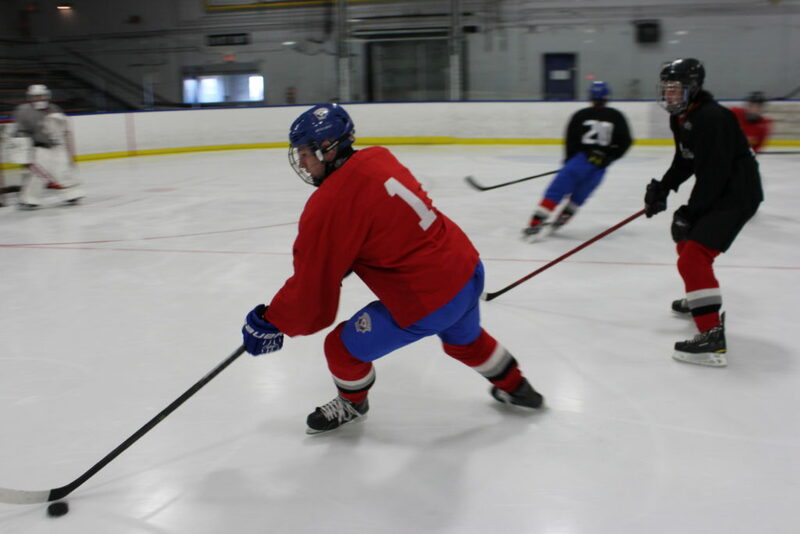 The National Sport Academy ice sessions can allow a student athlete to double or triple their repetitions in specific areas of their game during a hockey season. By focusing on skills and tactics to complement training in team systems, a player can double or triple their purposeful movement and individual puck possession time in 60 minute ice sessions as well as in an entire hockey season. The development of the necessary skill mechanics and tactics in competitive situations, where there is decreased time and space and increased traffic and pressure requires increased repetitions – repetitions that are scheduled in 55 – 65 additional ice sessions per year at the National Sport Academy. To develop the complete student athlete, the requirements are more than just the sport specific training. Below are examples of topics that are included in the 3 year National Sport Academy Coaching & Leadership curriculum. Don’t let your success be a coincidence. Explore the success and journey of other student athletes some of whom are National Sport Academy alumni, to design your success by having a clear vision of what you hope to achieve and a thoughtful plan on how to get there. Leading a lifestyle that produces results. Time Management – producing results for the student athlete. Organizing yourself to manage and minimize distractions in order to get into the Ideal Performance State. Goal setting – micro and macro goals. Have a vision. Plan success! Design your success! Failing forward – using the most important opportunities to improve and develop. Exploring local, national and international options available in the hockey industry. Hear from alumni that have experienced numerous opportunities. How to effectively promote yourself in the hockey market. Developing yourself as a student athlete in order to be marketable within the hockey market. What are your future teams looking for? How to get the most support from each member of your support team – teachers, coaches etc. Video clips – Student Of The Game. How do the world juniors / pros / Olympians do it? Understanding how to use the skills / tactics you are training on the ice? Develop a hockey vocabulary to assess yourself & communicate! Review, understand and benefit from practice & game analytics. 4 Steps of Checking – check like the pros to prevent opposition scoring chances in order to regain possession of the puck to go on offence. National Sport Academy training maximizes the effectiveness of the hockey energy systems focusing on injury prevention, strength, power, speed / agility / quickness and cardiovascular training. In addition, throughout this period of training, there are cross training activities we feel are important to developing the overall athleticism of each student athlete. Increase your strength & conditioning IQ to know how to train & fuel your body so you don’t get caught up in the endless shortcuts and magical workouts that promote immediate success but leave you disappointed with the results.